Magnetic nanoparticles were obtained using an adjusted Massart method and were covered in a layer-by-layer technique with hydrogel-type biocompatible shells, from chitosan and hyaluronic acid. The synthesized nanocomposites were characterized using dynamic light scattering, transmission electron microscopy, and Fourier transformed infrared spectroscopy. Biocompatibility of magnetic nanostructures was determined by MTT (3-[4,5-dimethylthiazol-2-yl]-2,5-diphenyltetrazolium bromide) cell proliferation assay, swelling tests, and degradation tests. In addition, interaction of hydrogel-magnetic nanoparticles with microorganisms was studied. The possibility of precise nanoparticles size control, as long as the availability of bio-compatible covering, makes them suitable for biomedical applications. The association of magnetic nanoparticles with hydrogel type biopolymeric shells confers to composite material bio-compatibility and the capacity to retain and deliver bioactive substances. This is supported by the fact that hydrogel-magnetic nanoparticles could be controlled by a magnetic field in order to facilitate their penetration in target tissues. 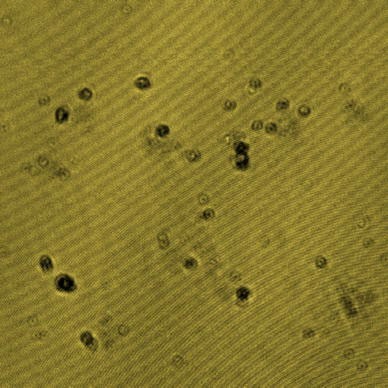 It is possible to obtain in this way “smart” nanostructured biomaterials, which could support different biotechnological and biomedical applications. Moreover, it should be underlined that by this way the main goal of nanoparticles employment is attained in therapeutics, namely to improve drug solubility and bioavailability , due to the fact that there is a need to develop suitable drug delivery systems that distribute the bioactive molecule only to the site of action, without affecting healthy organs and tissues . Ferromagnetic nanoparticles applicability in therapeutics had known an increasing interest. They are used either as contrast  and labeling agents , or as drug delivery systems [5–7]. The main aim of the present work was to synthesize magnetic nanoparticles (NP), with enhanced biocompatibility obtained by hydrogel biomaterial covering of nanoparticles, which preserve the nanometric dimensions, and moreover are nontoxic and noninteractive with pathogen bacteria. The developed nanocomposite material could be used for medical or biotechnological purposes. Water-dispersible magnetic nanoparticles (MP) were obtained according to previous studies, using an adjusted Massart method . Briefly, the magnetic nanoparticles were precipitated from an aqueous mixture of Fe2+ and Fe3+ salts (1:2 molar ratio), and treated with NH4OH at 75 °C. 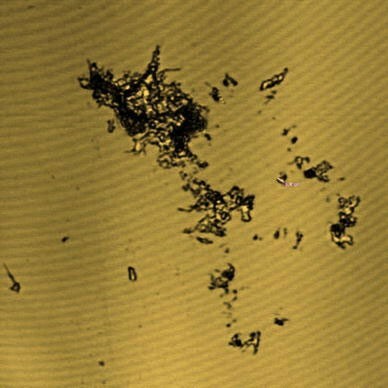 Subsequent to precipitation the magnetic nanoparticles were encapsulated in bio-polymer shells. Two different biopolymeric materials were tested, namely chitosan (Chit) from crab shells (Sigma) and hyaluronic acid (HA) (extract from bovine vitreous, own extraction method) . Two covering procedures were performed, namely (i) layer-by-layer coating—using 2% chitosan solution and 1% hyaluronic acid solution—and (ii) hybrid polymer coating. The hybrid polymer consisted of Chit–HA hydrogels obtained by physical mixing of 2% chitosan solution and 1% HA solution. Different ratios of chitosan solution and hyaluronic acid solution were employed in covering magnetic nanoparticles. Size distribution and characterization of bare and encapsulated magnetic nanoparticles were acquired using dynamic light scattering (DLS) technique, at room temperature using Malvern instrument (Nicomp 270, laser source, λ 632.8 nm) operating in the range 1 nm–1 μm. The morphology of the particles was investigated with transmission electron microscopy (TEM) and confocal microscopy, using a Philips EM 208, and a confocal spectral laser scanning microscope (LEICA TCS SP). The structure of hydrogel coated magnetic nanoparticles was characterized by Fourier transform infrared spectroscopy (FT-IR) technique using a Bruker Tensor 27 device. The swelling tests and degradation tests were performed, for both bare and covered nanoparticles. where %S is swelling ratio, mw is the weight of samples after swelling test performing (buffer immersion), and mi is initial weight. where %D represent degradation ratio, m0 is the original weight after equilibration time of swelling in PBS, and m t is the weight at time t.
Cytotoxicity of nanostructures was determined by MTT cell proliferation assay , a quantitative, convenient method to evaluate a cell population’s response to external factors. The key component is (3-[4,5-dimethylthiazol-2-yl]-2,5-diphenyl tetrazolium bromide) or MTT. Mitochondrial dehydrogenases of viable cells cleave the tetrazolium ring, yielding purple formazan crystals which are insoluble in aqueous solutions. The resulting purple solution is spectrophotometrically measured. An increase or decrease in cell number results in a concomitant change in the amount of formazan produced, indicating the degree of cytotoxicity caused by the test material. MTT test was done on Vero cells (kidney epithelial cells from African green monkey). These were seeded into 24-well plates at a density of 5 × 104cells/well and were cultured for 24 h in Dulbecco’s modified Eagles medium/10% FBS (DMEM). After 24 h, the medium was replaced with different samples obtained from hydrogel-magnetic nanoparticles (conc. 2–12 ng/cell). After 2 days exposure of cells to nanoparticles the cells were washed with phosphate buffer and 500 μL MTT solution (0.5 mg/mL) was added in each well. The cells were incubated for 3 h at 37 °C and the formazan crystals formed in living cells were solubilized in isopropanol. The absorbance was measured at 570 nm with a Jasco UV–Vis spectrometer. The viability of the treated cultures was expressed as a percentage of the control, untreated cells. The study of hydrogel-magnetic nanoparticles interactions with microorganisms was performed on Gram-positive (methicillin resistant Staphylococcus aureus Listeria monocytogenes), Gram-negative bacteria (Escherichia coli Salmonella enteritidis Pseudomonas aeruginosa), and yeast (Candida albicans). The testing of the antimicrobial and antifungal activity was investigated by a qualitative screening of the susceptibility spectrum of different microbial strains to the tested samples by adapted variants of the diffusion method . 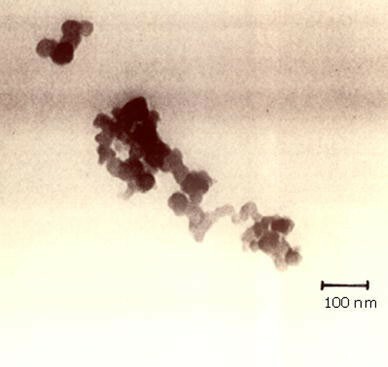 Magnetic nanoparticles were obtained by co-precipitation of iron oxides. NP from solutions of iron II and III were covered with successive layers of different chitosan and hyaluronic acid ratios, both in a layer-by-layer (l-b-l) technique and in a hybrid polymer covering technique, resulting in different variants of hydrogel-magnetic nanoparticles. Thirty-eight variants were tested, some of them, the most important ones, being presented in Table 1. Sample 22 exemplified in the table was obtained by covering magnetic nanoparticles with a pre-formed mixture of Chit and HA. Samples 13, 20, and 30 were obtained using three successive layers of Chit/HA/Chit (l-b-l technique) and sample 38 was obtained from MP covered with single layer of chitosan. In order to decide if the obtained nanoparticles are suitable for biological applications, characterization in terms of size, size distribution, and morphology were performed. The hydrogel-magnetic nanoparticles were characterized by DLS and zetametry to determine the size, size distribution, and zeta potential (Table 1). As could be noticed from the values of the particles sizes (in swelled stage), the layer-by-layer covering technique with three successive layers of Chit/HA/Chit seemed to provide the most suitable nanoparticles dimensions (180–264 nm), ensuring a degree of covering of the NP and a compact structure. The zeta potential values alternating from negative to positive values proved that the NP covering is efficient and, moreover, the final nanostructures obtained are stable, taking into account that the values are higher than 30 mV. Nanoparticles covered with one, or two layers of polymer, and those covered with mixed polymers finally presented too large dimensions detected by DLS measurements (Table 1). The synthesized covered magnetic nanoparticles were subjected to confocal laser microscopy analysis to provide some images of the covered NP, the results proving that a high degree of NP spherical conformation is obtained by l-b-l method with three layers of Chit/HA/Chit (Fig. 1). The samples obtained by hybrid polymer covering present clusters and a low degree of dispersion and have micrometric dimensions in swelled stage (Fig. 2and Table 1). Further studies were done only with samples suitable for applications in bio-medical area (especially for delivery systems). The morphology of nanostructures synthesized by l-b-l technique was studied using TEM. The obtained images (Fig. 3) demonstrate a homogenous distribution and a spherical shape of obtained nanostructures, a conclusion that agrees to that arising from confocal analysis (Fig. 1). In addition, the micrographs obtained from TEM (Fig. 3) show that the dimensions of nanoparticles, bare or encapsulated, are between 30 and 50 nm in dried stage. It is known that nanosized delivery systems should have dimensions ranging between 1 and 100 nm . 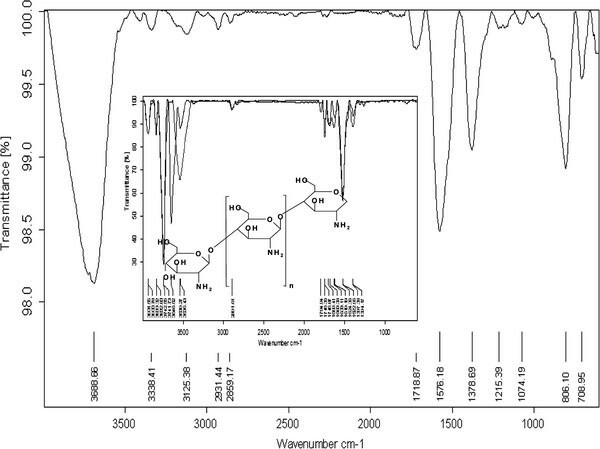 The structure characterization of the obtained covered NP was performed by FTIR. From the obtained spectra being obvious that the suitable covering of magnetic nanoparticle surface was performed, the structural pattern of chitosan and hyaluronic acid was observed on the NP surface. As could be noticed from Fig. 4the presence of hydroxyl –OH and –NH2groups from chitosan and HA on the covered nanoparticles is obvious. The specific bands at the wave numbers 3200 cm−1and 3680 cm−1, respectively, with their confirmation in the region 1790–1520 cm−1, are being easily noticed in the nanostructure spectra. The slight shift on the wave numbers values registered between chitosan, respectively HA itself and covered NP it is ascribable to the link of shells to the magnetic nanoparticles. With the argument of appropriate size, good covering, and suitable end groups being able to bind an active principle, several tests of biocompatibility were performed on the obtained nanostructures, the first step being that of swelling behavior. 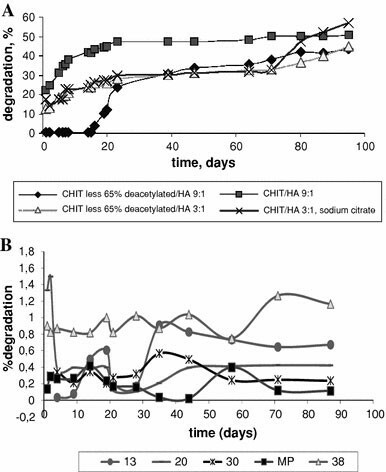 Experiments showed that the obtained nanostructures had similar swelling behavior with each other, the swelling capacity increasing with the enhancement of hyaluronic acid/chitosan ratio. The obtained swelling capacity for five types of nanoparticles is presented in Fig. 5, the higher value of the swelling capacity being obtained after 48 h.
The in vitro degradation studies for the encapsulated NP were performed in phosphate buffer solution for 80 days. The synthesized hydrogel-magnetic nanoparticles presented a great stability in neutral media, with respect to our previous studies about pellicle-type hydrogels degradation . 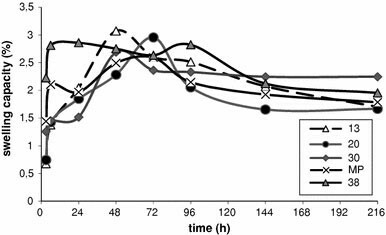 If for the pellicle-type hydrogels the degradation percent was between 30 and 50 in 40 days (Fig. 6a), the nanostructured NP stability increased, the maximum degradation percent attained in 80 days being <2% (Fig. 6b). The second experiment of biocompatibility concerned the cytotoxicity tests of nanostructures that were determined using MTT cell proliferation assay. 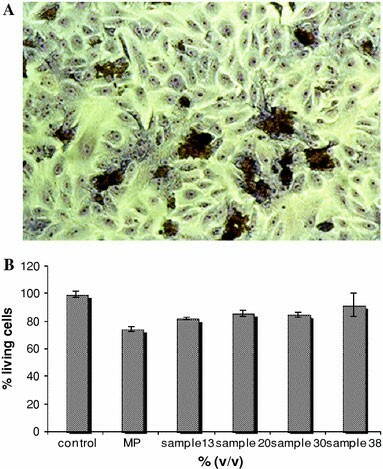 The tests for in vitro biocompatibility were performed in triplicates on Vero cells cultivated with different concentrations of magnetic nanostructures (between 2 and 12 ng/cell). As could be observed from Fig. 7, the obtained nanostructures are highly biocompatible, no cytotoxicity was detected in cells cultured after 48 h with highest concentrations of hydrogel-magnetic nanoparticles (12 ng/cell), the cell phenotype being normal (Fig. 7a), and the cell viability about 75% (Fig. 7b). At higher concentrations (20 ng/cell), the viability decreases, but it maintains over 65% (data not shown). The study of the interaction of nanostructures with microorganisms (Gram-positive, Gram-negative bacteria and yeasts) was performed afterward. Using three different variants to determine the microbial behavior in 24 h, the same conclusion was drawn, namely the NPs and nanostructures do not stimulate the growth of microorganisms (data not shown). Interest in nanosized drug delivery systems based on magnetic nanoparticles has increased in the past few years. Recent studies describe an approach in the formation of a novel hydrogel nanocomposite with superparamagnetic property based on magnetic nanoparticles suspension mixed with different polymers and cyclic oligosaccharide . Novel magnetic hybrid hydrogels were fabricated by the in situ embedding of magnetic iron oxide nanoparticles into the porous hydrogel networks; this magnetic hydrogel material was found to hold a potential application in magnetically assisted bioseparation . We obtained hydrogel-magnetic nanoparticles with a magnetic core (Fe3O4) encapsulated in layer-by-layer chitosan–hyaluronic acid hydrogel. The designed nanostructures were characterized, proving to be suitable to cellular wall penetration due to their dimensions  (between 180–264 nm in swelled stage, and between 40–90 nm in dried stage), spherical shape, homogenous distribution, and swelling capacity. FT-IR spectroscopy analysis gave evidence about the magnetic NP encapsulation in biopolymeric layers, the specific wave numbers for carboxyl-, hydroxyl-, and amino-groups signals from chitosan and hyaluronic acid being registered. Performed biocompatibility tests proved that the hydrogel-magnetic nanoparticles resulting from our experiments are biocompatible and relatively inert to microorganisms, so they are suitable to be used for loading and delivery of active compounds. This work was financially supported by the National Research and Development Agency of Romania, the Program of Excellence in Research (No. 129/2006 RELANSIN CEEX).